← How to Remove PC AntiSpyware 2010? I famously proclaimed that Digsby is my favorite instant messenger in this blog post. Digsby is a free instant messaging client that offered support for multiple instant messaging support including Gtalk, Yahoo, MSN, AIM, etc. It also stodd out by offering support to social media sites such as Facebook, Twitter, etc making it a one-stop application for all your instant messaging and social media update needs. Digsby also sported a themable intuitive interface. All was well until Digsby needed to monetize its popularity. Any freeware startup needs to find a way to monetize to keep its business running and profit from it. This is definitely understandable. Digsby has done the same and as they state in their blog post, they are experimenting. You have probably seen in many free software where they hide the fact that the ‘Typical setup’ includes installation of browser toolbars or some adware and hide the ability to not install under ‘Advanced setup’ or ‘Custom setup’ options. Digsby has resorted to the same model but offering to install not one but SIX crapware! Atleast, those install options aren’t hidden in Digsby but you have to choose to Decline all 6 offers if you don’t want them installed in your computer. 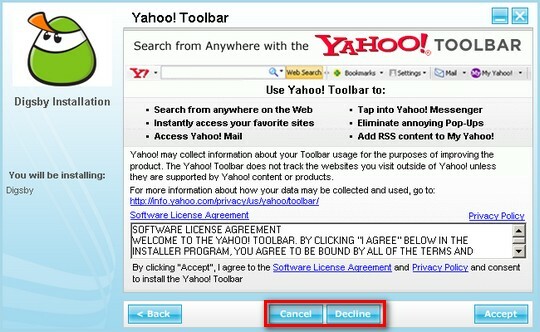 And you have to uncheck two checkboxes that will change your browsers home page and default search engine. It’s 100% optional but usually these tactics aren’t aimed at the tech-savvy users who would know not to choose those options. It’s aimed at folks who are used to clicking ‘Next’ or ‘Ok’ blindly until the software has finished installing. Digsby comes installed with a research Grid Computing module. While installing Digsby, buried in the TOS, you agree to lend your computer’s CPU power while your computer is completely idle. Agreed you can disable it in the main menu by going to “Help > Support Digsby” and disabling the “Help Digsby Conduct Research” option. But, this shouldn’t be hidden so much and atleast should have been a screen along with the crapware opt-out screen and not turned on by default. Honestly, I didn’t know I was letting Digsby use my computing resources and my electric power (however little that may be) unknowingly. As I mentioned above, I am all for a business trying to keep their lights on. But, for a company who could be so innovative in creating an instant messenger client that so many people have come to love, resorting to these well established shady money making practices doesn’t bode well for me. I am not going to rebel and just uninstall Digsby because of this one episode. I am sure Digsby would hear us and make some positive changes in the future releases. A great example that this is already happening is a poll they have in their blog post. 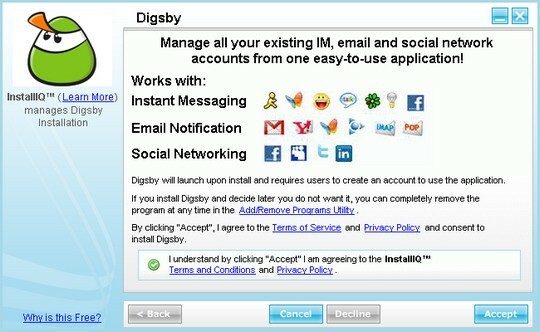 This is a good sign that they are listening and I hope Digsby will again become my favorite instant messenger. Again. We updated Digsby to provide a pop-up notification the first time Plura tries to run. You are 100% right though, we made a mistake in not being more upfront. We’ve been reading every comment on our blog to see how our users feel and how they want us to proceed. I apologize for this lack of transparency and hope that we can become your favorite instant messenger again. As I mentioned towards the end of the post, you are already doing the right thing by listening to your users and responding positively. Like I said, I didn’t even uninstall Digsby as the quality of your product hasn’t gone down and these little infractions can be corrected.